In early November I got this email from a teacher in Pakistan. She send me their mailing address and I shipped off 50 postcards and a bunch of art supplies to a place called MC Girls High School is Faisalabad, Pakistan. Recently she sent some photos back of the girls participating. I wanted to post those photos here now to show the continued global reach of this project and the importance of spreading peace as we consider this a cross-cultural celebration of creativity. This is more than an art-for-peace project, this is a dialog between students around the world about what it means to create peace in our lives. In Uganda, young people I have talked to use the term “ENOUGH” in response to being fed up with living in a state of war and violence for so many years. It is my hope that more people can catch on to this way of being and being to take steps in their lives to create peaceful positive change. Let’s put the messages out there. Let’s spread love and uplift people with the art in our hearts. Let’s take the time to see and listen and be with each other in an accepting and loving way. 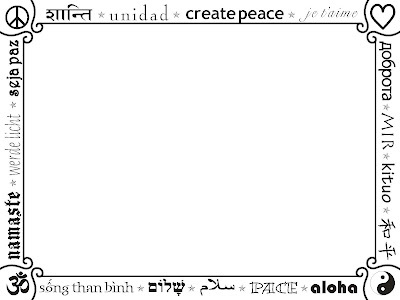 Let’s Create Peace….and it is my hope, intention, and purpose to do just that. Wednesday was the third and final day for the ladies of Off the Mat, Into the World, on site,helping to build the school with Building Tomorrow. It was my second day with them and indeed a pleasure to be able to share the joys and excitement of their amazing experience. We were in the rural district of Mpigi Villiage, about an hour west of Kampala and the locals were all out for this final day with this group of Westerners. The ladies had brought a number of gifts for the kids: balls, stickers, frisbees, books and other fun things to share. They also were enthusiastically engaging the hundred or so kids in numerous fun activities….drumming with them, doing yoga, movement play in a large circle, and extending their hands to continue supporting the ground work on this six room school. Around 1pm I laid out a small tapestry as the central art space and almost immediately the kids started swarming. I think there were around 120. Kids of all ages, the majority between 10 and 15 years of age. They were so excited and super curious about what I was doing they kept crowding closer and closer to the center. Thank fully our friend Jimmy, one of the site coordinators and community leaders for this project, stepped in to translate and assisted in creating a touch more space. Having borrowed 35 art boards from In Movement, and carrying enough supplies for 20 kids to work, it was quite the intimidating sitting there on the ground, surrounded by hungry eyes, curious to what was going to happen, trapped behind a language and cultural barrier, but committed to the craft I had laid out before me. To gift these kids postcards created by students in the U.S. and have them create their own to be delivered to students in our next destination…..INDIA….later this year. I was fortunate to have the support of a few of the ladies. Megan and Seane quickly came into the middle to help orchestrate and our friend Suzanne brought her drum to calm and connect the students to the collective experience being created. After explaining the project and what we were going to do, showing them a map of the world and explaining where the cards they were going to get came from and where their art work was going, I asked them to close their eyes. Like most young people this can be a challenge. But from the looks of the group, many were able to drop in. I asked them to breathe deeply, to feel the excitement, to feel their hearts, and notice their breath. Breathing quietly for about a minute felt like a long time and then we chanted the sound of OM. This was a magical moment and it lasted for more than a couple minutes as we repeated the sound of OM continuously. I felt deeply moved by this and was quickly aware of the tears in a few kids eyes, the depth of connection and passion shared by many. This was the perfect transition into the art making. There on the dirt, students in the front spread out. We asked the crowding group to back up, to create some space, and the kids took turns. They had boards laid out before them and about 20 or so were able to get into the art making at a time. Having instructed them to draw things that made them feel happy, or represented Uganda to them, they had no time picking up any of the variety of supplies and drawing on their Peace Pals postcard. The process lasted for about 90 minutes. It was totally intense. Cramped in a tight little space on the earth. Students gathered closely around eager to get involved, to draw and express themselves, and excitedly awaiting their US postcard. I am going to continue to watch and listen to the behavior of the Ugandan youth in relation to art supplies and the act of being creative and report back on my observations. But for a first experience, in a spontaneous and organic way in this rural setting on the ground, I had a magical time and I am pretty certain the kids did too. And away they walked, Mothers and infants, students and elders, as one large group, back to their village a couple of kilometers away. Monday morning traffic in Kampala is insane. It simply does not move…..well, it moves, but super slow. From several miles outside the center of town, cars and trucks inch there way along. Riding with Bacali and Lynn to our respective destinations, it was clear that I was going to be late to my 8:30 meeting time, if I stayed in the car much longer. So out I hopped and onto the back of a boda-boda (motorcycle taxi) to zip into the Sheraton to join up with the ladies from Off the Mat Into the World. We took an hour bus ride out of town and into a rural area on the out-skirts of Kampala. Veering off the main thoroughfare, we drove along a long dirt road to a site about a mile into the farmlands to an open plot of land, the foundation of a building being laid, and a community of people gathered round to watch as this group of Westerners arrived to help build this school. Off the Mat’s Seva Challenge required participants to raise $20,000 to enable them to join this trip. 20 women from 12 states and two Canadian provinces achieved that goal….collectively raising more than $500,000… and were here to continue their work in service of the two causes they were providing for in Uganda. Having spend last week with a Birthing Center north of Kampala, this was their second cause for which their money was being donated. The ladies will spend three days on site, working with the local community and the team from Building Tomorrow to help get this school on it’s way to being built. From our opening meeting yesterday, it looks like there will be a new school for the several hundred students they aim to serve in the next 4 months. We spent the day hauling bricks, shoveling dirt, leveling ground, and helping to get this school’s construction ramped up. The highlights included seeing all of the kids get involved and helping out. A long assembly line passing bricks from the stacks near the brick making machine, around the corner of the foundation and into the furthest place they needed to go was a remarkable sight to see. The kids loved working with us Westerners and for a long while I had a crew of boys working by my side. For every move I would make, they would be right there next to me. A beautiful day and a wonderful way to be in partnership with two amazing organizations, of service to the benefit of this community and the students who will attend this school. After a hard days work, elders provided Sugar Cane for all the youngsters on site. It was a real privilege to watch as they waited patiently in line, and then bent knees slightly in gratitude for their sweet treat. I am finding the cultural differences between American students and the Kids I have encountered in Uganda stifling. I think America students have a lot to learn from the behavior and respect of these young people. And….I could see these Ugandan kids learning a ton from students in the states as well. Yesterday was a magical day. Lynn and I joined In Movement (www.inmovement.org) for an afternoon of art making and creative interaction with the kids at Kayeda Orphanage. Kayeda is located here in Kampala and serves about 60-80 orphaned kids from ages 1 to 19. Situated in a relatively gnarly part of town, the team of facilitators carried art supplies from teh dirt road, down a narrow ally, between buildings, across a ditch of filth and into a cluster of buildings near the bottom of a hill. No walk ways or steps. Just exposed earthen dirt and rocks, broken bricks and trash lining the path. Kayeda has what looked like two main buildings, and several dormitories. Kids sleep in bunks stacked three high and four units per room. So in a room smaller than the size of your bedroom, 12 kids live and sleep. In Movement has been working with this Organization for many years and each year they host a showcase day to demonstrate the crafts and activities they do to the newer, uninvolved students as a way of inspiring their future participation and involvement with these programs. We set up art stations to showcase the music and singing, dance and movement, acting and performance as well as the visual art components of their programing. Eyes everywhere, following our movements….watching with deep curiosity. in the room, but also so much love and respect and authentic curiosity to what we were doing. The willingness to participate and the excitement and joy demonstrated by all the kids was just brilliant. The kids were thrilled to have us, the group of 8 facilitators, there to lead them in the numerous activities. And then the amazing showcase of all the different activities drew an attentive and appreciative crowd. It was a wonderful first day to get hands-on with some Ugandan kids. I feel completely blessed to be in the company of such loving and warm people and have the opportunity to share my gifts through the creative arts. This video shows a number of the kids, not the regular In Movement participants, getting their hands into the art supplies and simply playing with the array of medium we laid out. At first the lead Facilitator John Mary, did not want these to get involved. He wanted them to simply observe, as a way of showing them what was available to them…but with a crowd of excited youngsters standing on the side watching, it was hard for me to not invite them to play. So, I did. We quickly rearranged the space, moving paper and supplies, making more room for additional participants, and invited the kids to join in a bit of creative collaboration with us on the floor. I look forward to a longer, more involved next experinece, but a lovely first taste of spontaneous creative time with these loving and appreciative kids. The newest Peace Pals postcard has gone to print today. After a slight soaking when leaving the printers earlier this week, I returned today ~ a bright a sunny day, to make payment and confirm printing of 3,000 of our newest design. Thanks to designer extraordinaire Laura Aleo for her countless hours of work getting this baby just right. I believe it’s all there and my hope is that Graphic Systems, the largest and most advanced printer in Kampala will handle this job with ease. I look forward to their delivery in the morning…..and more importantly I look forward to seeing what the kids of Kampala and Northern Uganda create on these blank cards in the coming weeks. One week into my stay in East Africa and I am pleased to report that all is going wonderfully. I’ve had the softest landing into Africa that one could possibly have. Much thanks to Lynn for all the wonderful connections. She’s helped to make this the easiest transition and arrival into a foreign land as one could imagine. This morning I got dropped off at the ATM and choose to take the long walk home. It was about 5 miles, I’d estimate. A nice time to really observe the life and culture of this place, the haps of the streets, to soak it in, to feel the multitude of eyes and stares, the shouts of “mazungu” (white person) from people of all sizes, the friendly ‘hellos’, the looks of ‘what is that tall white man doing walking the street’, and the countless offers of rides from the boda-boda drivers (Motorcycle Cabbies) to take you where ever you are going. On our first walk down to the lake (Lake Victoria is about a 5 minute stroll from our front door) and on our return, a man on the road asks me if I wanted a monkey. Lynn quickly notes that she has never been asked such a thing in the 10 years she’s been come to this region. On Thursday night we went out for a Bob Marley 65th Birthday Concert. A great night to be out and get a feel for the local scene. Lots of ex-pats was both comforting and a bit shocking. So many white folks in this area, many who have been living and working here for many years. The concert was cool. The main band Blood Brothers were solid and then with a continuous shuffle of artists and musicians, the stage became a revolving door of new and improved sounds….up the tempo, increase the beat, and the funk flowed. We danced and mingled befoer exhaustion set in. Found my printer for printing postcards. And today is the day to make that happen. In Uganda, everything is done with CASH. And our driver Bacali. Say hello to our good Friend…..selecting a papaya for Lynn. When you set out to do an international peace project for the first time, having little to no experience, it’s hard to know what will happen. When the idea for Peace Pals was first born, my friend Ken Masters and I sat down to discuss the objectives and goals of the project. It was really clear that two things needed to happen. 2) it needed to be viral: as in, the project needed to have a self-perpetuating mechanism for on-going and continuous involvement of participants. And so, Peace Pals began to take form. The idea was to have students in the U.S.A. create postcards for peace by making art and sharing their personal messages on the backs with words and then deliver their finished works to students in another country. The recipient students who received a postcard would then themselves created one that we would then deliver to students in anther location….as in Create Peace and Pay it Forward. In this way, we create an open loop with an on-going and potentially viral experience for anyone to get involved. Peace Pals is about spreading peace using creativity student to student across the globe. So the idea came to life, and the project got set in motion. My team and I personally worked with more than 1,500 Bay Area California students between September and January while sending another 2,000 plus postcards out to schools across the country. And so now, here I am in Kampala, Uganda with 2,500 plus postcards for peace, created by students from across the U.S. preparing to deliver them to students in schools here. Tonight I found myself in the washroom rinsing my mouth and realized that although the water looks clear and clean and we’re staying in this nice house with all the amenities, including a fast internet connection…. and you look around it kind of feels like you’d be on Maui, it’s not Maui. It’s just NOT. If you peer outside, on the surface you might think it’s Maui, or some other tropical haven for easy living and casual reprieve, but it’s just not that kind of place. This is Uganda. This is sub-saharan Africa and it’s a wee bit different. Granted, I’m in love with the sounds. The birds have me captivated. The squawking and gurgling, the cackling and the coo-coo’ing. The insects look like Maui insects, the ants are huge. The flora and fauna are a gorgeous and glowing green with flowers bright and brilliantly alive. Birds in flight with 4 ft wing span. And that in-door out-door living that only comes with tropical temperatures is amazing. But you know what. As easy as it would be to slip into a casual and care-free approach to Ugandan living……You CAN get sick from the tap water. You CAN get sick from bacteria in the food. You CAN get malaria (although I am NOT going to) from some random mosquito bite…. so, I take this opportunity to remind myself as I remind you. This is NOT Maui. YOU ARE IN UGANDA. And so, allow me to remind you, as I remind myself. I think that does it for now. Day 2…in the books. Good thing for this Internet connection….that’s a serious plus…. even though you kind of feel like you’re Maui….YOU’RE NOT. Can’t you hear that “Do” happening down by the lake. Sounds like Africa, and it’s high time to play it like it is. Across the globe. 17hrs of Flying. Two nights, one hotel, a couple mediocre meals later and into the Entebee Kampala Airport and the capital of Uganda we arrive. Lynn’s driver Bakali picked us up at the airport just past 10pm local time. A quick 40 minute drive into town and around to our friend’s Gizmo and Ilonka’s house just above lake Victoria. (Lake Vic). It feels great to be here. Three big bags of gear, including 2,500 plus postcards, a duffle bag full of art supplies, an assortment of speciality foods, and clothes for 3 months in Africa has me all set. Excitement is setting in and auspicious signs abound. Off the plane and waiting for the shuttle to the terminal, I ask a well dressed gentlemen if he knows his way around these parts and he quickly replies, “Yes, I live here.” Sharp as he was dressed, he knew this was my first time to Uganda. “What are you here to do,” he asked politely? I told him about my plans to deliver postcards for peace from U.S. students to students here and my vision for working with 10-15 schools. And I returned the question, “What do you do?” He told me that he was the principal of the International School….and my first connection was made. He passed along his information as we waited in line for a Visa. He welcomed my call and I felt it all to serendipitous to have met the principal of one of the most respected private schools in Kampala before I had even left the airport. Gathering our luggage, Bakali arrived just as proper Ugnadan would, 15 minutes late, and we drove to Ilonka and Gizmo’s house down by the lake. As we approached their place, we spotted an Owl sitting on a fence. Another auspicious sign….a sign of the protector, symbolic of inner- knowing, and an emblem of wisdom. Lynn said that in the ten years she has been coming here she had never seen an Owl…and we got a sighting on my first night. Another good sign. Feeling fantastic about being here. Getting mind~body~spirit aligned today after a whole lot of travel and excited to see what’s to come. It’s wonderfully comfortable. Warm, not too hot, and most enjoyable to be in Africa. We left San Francisco at 8pm Sunday night, flew through the night, arrived at London Heathrow at 2pm the next day. Today. It was a long night, tossing and turning, luckily I had a couple of seats open next to me to spread out. Beautiful architecture. The river Thames. A lovely little walk to loosen the legs from a long flight. A bit to eat and back to the hotel to chill. Tomorrow we depart at 8am for the airport. 1045 flight to Entebee, Uganda.